Today I present to you a meal that will delight mutton lovers. The Mangalorean style Mutton Stew with coconut milk is one of my most favourites as it reminds me of my childhood. My mother used to make a lot of coconut milk based curries especially this one. I don’t really make it a lot here as my son can’t manage curries with coconut milk, perhaps because he is not used to it. When I made this curry I couldn’t wait to dive into my lunch plate and devour it! Mutton has always been my favourite meat and so I enjoyed every bit of it. 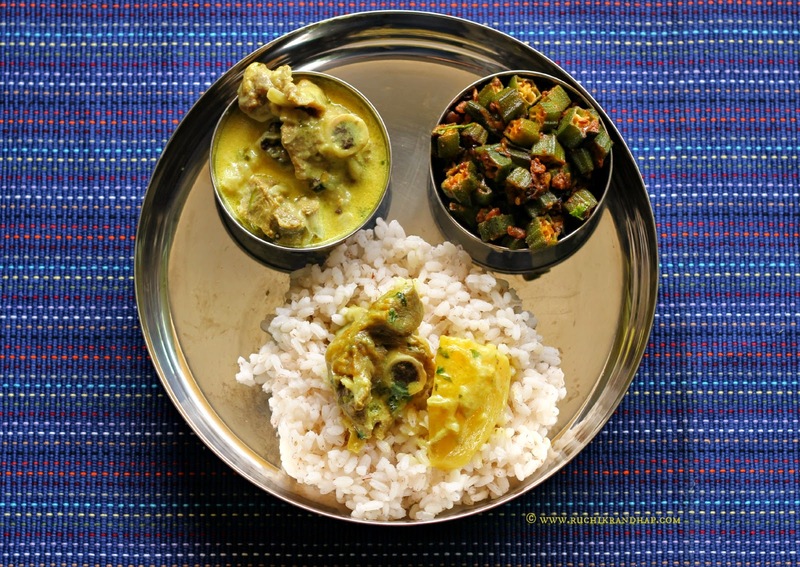 The Dry Masala Bhindi is my own invention – have been making okra/lady’s finger this way since years as nobody really likes it if made the thel piao (Mangalorean oil and onion style) anymore as it turns slimy (which I am ok with but its hard for the kids to eat). I will post both these recipes by tonight. If you noticed, today’s boshi is the 25th one on my blog – Silver Anniversary! Yayy! I wanted to know if you enjoy this series or are bored of it. I make it a point to post one new boshi every Wednesday and have never broken this tradition although I have taken a complete break from it during the Christmas season. Do let me have your feedback. Write to me at ruchikrandhap@gmail.com and let me know how you like it, whether you’ve tried any of the boshis that I present and if yes, do send me a picture and I’ll display it on my Facebook page! 1. Mutton Stew – Recipe coming up next!